T his quiz show magic trick differs from many other magic tricks as it is presented in the form of a quiz show game. By not uttering the word magic during the ‘trick’ you will throw the audience off and they will no be suspecting the sneaky maneuvers you are pulling. This misdirection allows you to use your magic utility prop right underneath your audience’s noses. 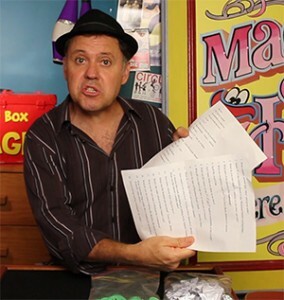 The quiz show magic trick requires you to use the Magic Force Bag that I have made in a previous lesson. Once you have made that you will need to download and print the question and answer sheets. These can be downloaded by clicking the buttons below.